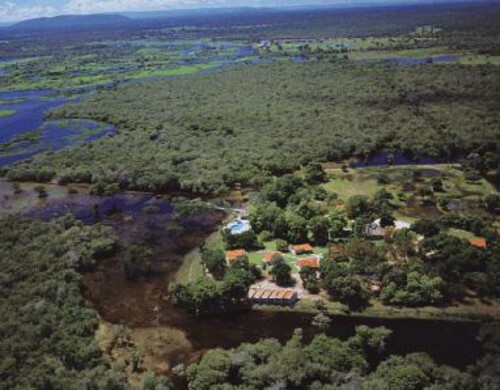 Located in one of the Pantanal's most beautiful regions, Pousada do Rio Mutum is an ideal place for excursions on horseback, by boat and on foot in the unique forests, wetlands and rivers that form the enormous Pantanal basin. The nearby Mutum River feeds two lakes including the 15 km wide Lake Baia de Chacorore that's easily accessed from the lodge. The lodge gives you the opportunity to stay in a safe place in the middle of nature, surrounded by unique and exotic animal and plant life. The Pousada do Rio Mutum reception area has a TV room, souvenir shop and a restaurant. Nearby is the landing strip, the swimming pools and the lodge's twenty-two permanent, air-conditioned quadruple and triple rooms housing up to 58 people. Ceiling fans, minibars, closets, international telephone connections, a private porch and hot and cold water in the showers complete the surprisingly sophisticated amenities for such a remote area. If you want to get away from it all, this is about as far away as you can get!